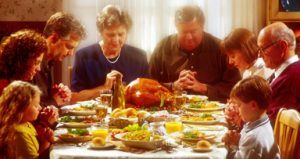 In a couple of days, most of us will sit around the table with family and friends in our annual ritual of setting aside a day to be thankful. It’s a wonderful tradition, and one of the few things anymore that cuts across almost all of the political and demographic lines that seem to be so sharply drawn these days. As a nation, we have many things to be thankful for. The economy has been strong, almost anyone who wants a job can find one, with some exceptions the world has been generally peaceful this year. Yes, this nation and this world have problems, and always will, but at least we can look across the landscape and see more good being done than evil. Individually, we are thankful for our clients, some new and some who have been with us more than a decade, who are a pleasure to work with and who have kept us in business now for 17 happy years. Of course, when you give thanks, you have to be expressing that gratitude to someone. That implies a Higher Power, a being who is in a position to provide those things for which you are thankful. That’s not always front and center in what has become more of a secular thanks-for-turkey-and-football holiday that increasingly serves almost as much as Black Friday Eve as it does a Day of Thanks. As for Kristine and me, we give thanks to God, the Creator of all that is good in this world and in our lives, and who offers us the promise of an eternal life that is so glorious that it is beyond compare to even the best day any of us has ever experienced. We try to express our thanks every day, and hope that you too can be thankful with each passing moment for the people and the experiences that make your life worthwhile. But still, it never hurts to set one day aside and really focus on thankfulness. We hope you take the time to express your thanks this Thursday, and that you have as many things to be grateful for as we do.